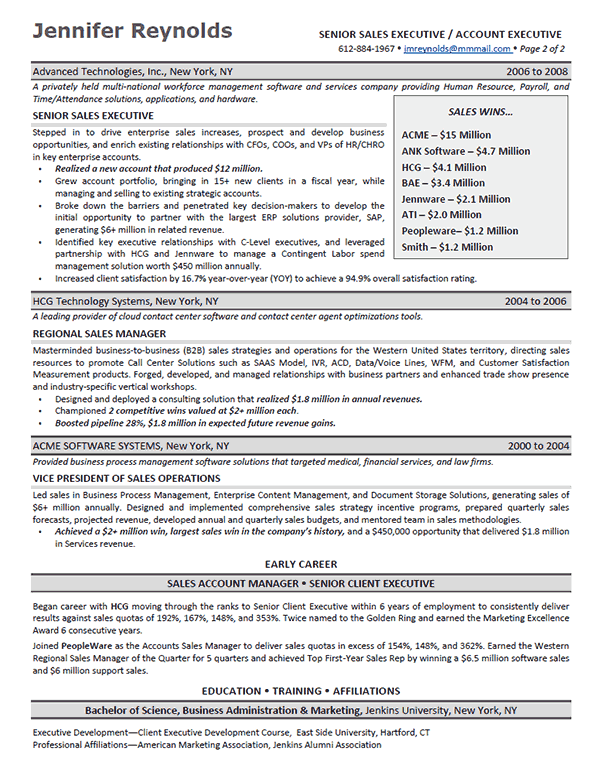 This post includes a resume for a high level professional with experience managing the sales of enterprise software systems. This example is a suitable reference for anyone with executive level sales experience working with Fortune 500 companies. It can also be used as a reference for anyone that sells large scale software systems or technological products. The document uses a small but powerful logo of an increasing bar chart that should help capture the imagination of the reader. Anyone can clearly see in the job titles that this is a top level sales professional. The summary paragraph quickly identifies the scope of the job seeker. The summary demonstrates that this individual manages large scale sales initiatives of enterprise software, generating multi-million dollar revenues for top end corporations. The grey area also documents some of their core skill sets such as contract negotiation, budgeting, business development and presentations. To take the summary area even further, the writer identifies 5 major sales benchmarks. These accomplishments are placed towards the top of the resume to demonstrate their level of expertise. The resume shows the ability to earn millions in revenue by succeeding where others have failed. The achievements even prove successful sales efforts with different departments, global markets and additional IT verticals. The job experience section uses a title headline and a small statement that summarizes the company. In this position, it is important to note the size of each company. After another brief statement that outlines their core responsibility, the writer documents even more specific achievements at each position. The author even uses graphic examples of sales improvement using bar charges and quantified results. The majority of content is used on the most recent job positions since 2000. Previous work and initial jobs are simply noted in a section called “Early Career.” When you show that you succeed as a high level sales professional for a large corporation, it’s not going to be important to write an entire page on your entry level job positions. The education and training section lists their Bachelor of Science degree and affiliations. Spearhead efforts to generate revenue for the sale of enterprise software solutions that integrate accounting and benefits administration. Represent enterprise software group for national events in order to develop software visibility, product penetration and growth. Ensure that enterprise sales team meets or exceeds quarterly sales goals. Oversee design of software solution proposals that involve implementation tactics from multiple departments. Manage cross functional sales and marketing group tasked with creation and execution of revenue growth strategy. Direct corporate initiatives to qualify major leads by meeting with decision makers at Fortune 1000 organizations. Analyze sales reports and develop plans to increase lead generation, close rates, and customer retention. Keep abreast of competitive landscape and work with executive staff to develop competitive products that increase market share. 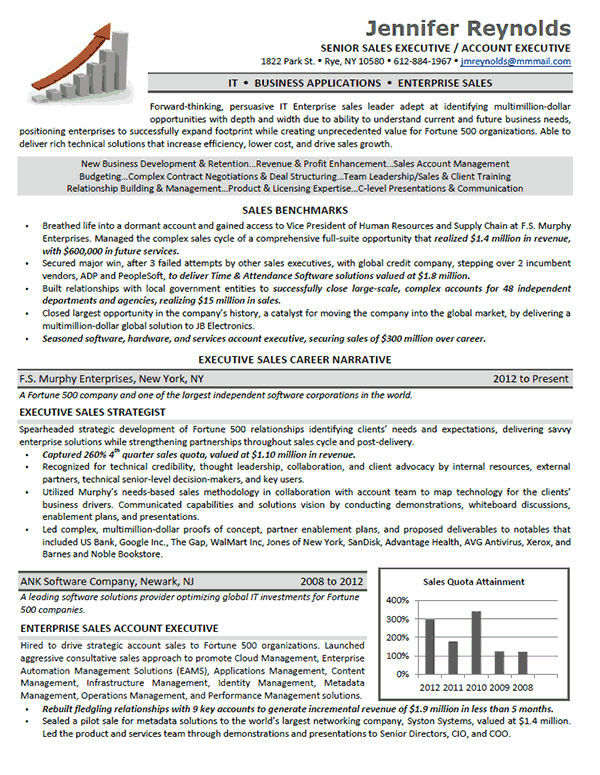 Enterprise Sales Executive Resume Example Contributed By Professional Resume Services, Inc.